I often get in cooking ruts. The majority of the people in this family do not like many interesting foods. This means that I cook the same thing over and over. And over and over. And over and over again. Recently, I was delighted to discover a new recipe using ground beef (my rotation of chili, pasta and meat sauce, and taco salad was getting old). It was just what I was looking for: very easy and made up of ingredients that I already had. Also? It wasn't tomato saucy. A little variety is always a good thing. I found the recipe on the website This Glorious Day. The author of this blog adapted it from another recipe, found here. I followed the adaptation almost exactly, until I got to the green onion part...only because I had no green onions. Oh! I also did not cook my beef in the oil, since it was already cooked and in the freezer. I crunched up the frozen meat with a metal utensil while it was in the freezer bag to loosen it up, then put it in the skillet and mixed up the other ingredients in a cereal bowl (this is where I added the oil). Once the other ingredients were combined, I poured it over my beef and let it heat up. 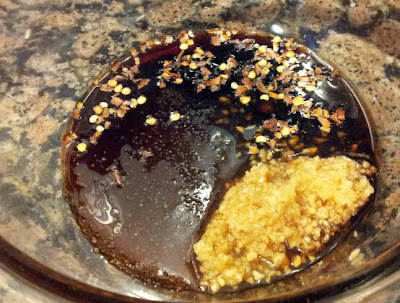 The second time I made the sauce, I doubled the recipe (and added extra garlic) (my garlic is not fresh pressed, but from the fridge). Michaela did not care for the beef version the second time I made it (she liked it, but has trouble with ground beef these days...that's all I'll say about that), so I offered her the sauce with some pork that I had in the fridge, already cooked. I also had cooked rice...bonus! 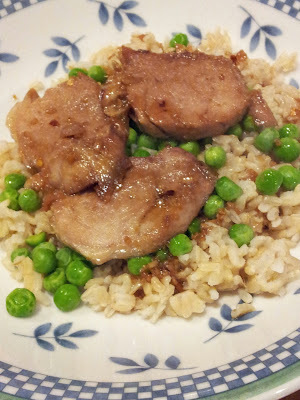 I put the rice in a bowl, heated that up with some peas, and put the warmed up sliced pork with sauce on top. This sauce could be used on chicken too (Michaela has eaten it on chicken as well and liked that the best out of the three meat choices). It is very good, and so simple! Try it...this is one that will be in our reportoire from now on. If you adore football, you possibly have a favorite team from the National Football League or two and have a list of players who like to have seen. Sauce of the Asian origin and for the disaster stoppage and for the protection. It is the intrigue and important. It is the widely resultant and widely used at some places. It is the entailed and discussed.